It goes without saying that Charles Lindbergh, Jr. was a national celebrity made famous for the first, non-stop transatlantic flight that he completed while piloting the 'Spirit of St. Louis' in 1929. Lindbergh moved to Hopewell, NJ with his bride Anne Morrow and made his home here until shortly after the highly sensationalized kidnapping and murder of his son. The Lucky Lindy Ox pays tribute to Lindbergh's presence in the Hopewell community by embellishing it to show clear influence of the 'Spirit of St. Louis' plane (renamed to reflect 'Spirit of Hopewell') by using metal-look paint to recreate the look of an aluminum bodied aircraft. 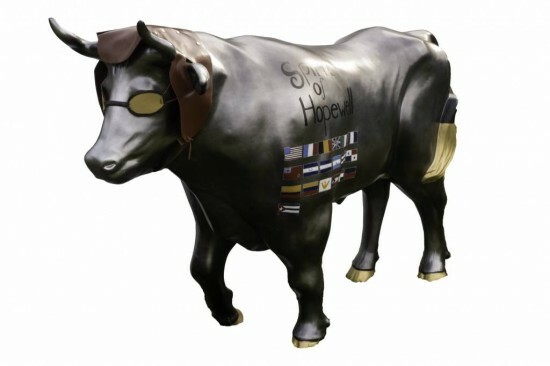 The paint is a unique process that began with painting the ox black, adding a clear coat, then slowly adding a metal-look paint over the black finish. The end result is an ‘older’ looking metal. In addition, the ox sports a leather aviator cap and goggles to add a whimsical flair to the more industrial look of the ox body made to represent the famous aircraft. The font/writing style of the Spirit of St. Louis plane is replicated and altered to state 'Spirit of Hopewell' and the aviator emblems and tags of the original aircraft are replicated to match the Spirit of St. Louis plane.